Earlier this year I stumbled upon a video of a guy calling himself Benny the Irish Polyglot that got me realizing that I was making a lot of excuses about my progress with the French language, and wrote about it. Benny was cool enough to repost my blog on his site (which is a great resource for anyone trying to learn another language, so check it out, here), and I figured I owed it to anyone who stopped by to post something about my progress.Although Benny is impressive enough to accomplish fluency in three months, I haven’t been. I could give you some more excuses, but let’s just say I haven’t had the chance to focus on French as much as I would have wanted, especially in the last quarter of 2012. That being said, a few notable things have happened lately that have me giving myself a small pat on the back. Not only have I had friends and co-workers telling me that they have noticed my progress (well, not all of my co-workers, but you can’t force someone to be encouraging), but I actually had my first French phone call the other day, and both parties were understood. Sounds like a small accomplishment, and maybe it is, but it’s one I wasn’t able to do not so long ago (plus, I find phone conversations, especially when they are unexpected, to be particularly difficult as hearing, tone and other communication signals are less clear). Needless to say, compared to where I was at when I wrote that fateful post, in my mind I’ve come a long way. Duolingo. So you don’t want to pay a million bucks for the yellow box promising you fluency? Me either. Other expats turned me on to the online language learning program at Duolingo, which is a great tool, and happens to be free. I’ve also recently downloaded their mobile app, which helps to keep practicing even when you’re on the go. Reading. My I equipped my trusty Kindle with a children’s book in French (the first Harry Potter) and a lovely French-English dictionary. The reading is slow, the book isn’t as easy as I was going for (plus I’ve never read any of the books in English so I can’t cheat by remembering what they say), and there are a lot of made-up words, but I have to say that it has definitely helped me to learn a lot of new words, and in a usable context. How cute is this owl? 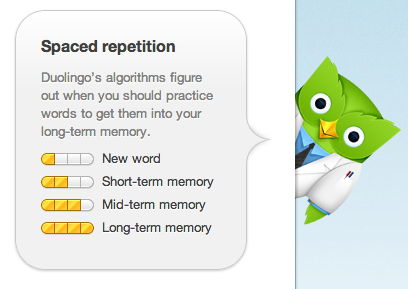 Another great reason to use Duolingo! And don’t forget to go to Perpetual Passenger’s Facebook page and click LIKE! More photos, more nomadic ramblings, and just a general good time. Thanks! Keep up the good work! I’d also like to recommend a site that I still find incredibly useful, even after years of learning and speaking French (and am still learning it). It’s a website called Forvo (http://fr.forvo.com), which, once you figure out how to navigate it, has an online database of pretty much every word and expression in French (among other languages) recorded by a native French speaker. It’s excellent for helping you learn how to pronounce a word, as many dictionaries (especially pocket ones) aren’t that informative on pronunciation, or have a phonetic chart that is hard to decipher. In order to improve my accent, I test myself by reading a short article (often with words that are tricky to pronounce; you can do the same for the Harry Potter series, which I myself read when learning French and found an incredibly useful exercise) and I record my voice (on my Mac’s garage band). Then, for words I’m unsure about, I compare my pronunciation with that of a native speaker’s. You’ll improve your accent by leaps and bounds over time! Your blog is as great as always, thanks for sharing this post. I just signed up for italki yesterday! So funny you mentioned that. 🙂 I haven’t actually tried it yet, but figured I need to exploit all my resources. I’ll definitely check out the YouTube channel, also! Every little bit counts! It seems like native English-speakers are super in-demand on itaki. I get a few requests to be language partners every time I log in, especially since I’m learning a few languages. I didn’t know that! I joke around with friends in Paris that I could make some extra $$ on the side if I could find a way into giving English lessons… but I have a feeling it’s not in my best interest to do that until I’ve mastered French. Otherwise I’d be speaking English in AND outside of the office! LOL I understand. When I lived in Seville I was in a language immersion program, as my “mission” was to perfect my Spanish, but I also needed to earn some more money so I taught private English classes as well. I tried to only speak English if I was being paid to do so, ha. If you do a [free] language exchange with French and English, then you would both be practicing each other’s language without feeling the pressure you might feel with random Parisians out and about. As an EFL teacher, I wanted to have language exchanges to meet more Spaniards, but I didn’t want to speak English and not be paid for it lol. For all those language learners out there, here is an incredibly motivating post on learning a foreign language. Some of the comments below are equally valuable. Moral of the story: take advantage of every opportunity you have to improve your foreign language skills! Great tips — thanks for sharing. I’ve been looking for a way to improve my (kindergarten-level) French that involved more than just pounding the books. Duolingo seems like a fantastic resource. We will check it out! Thanks for the tip!